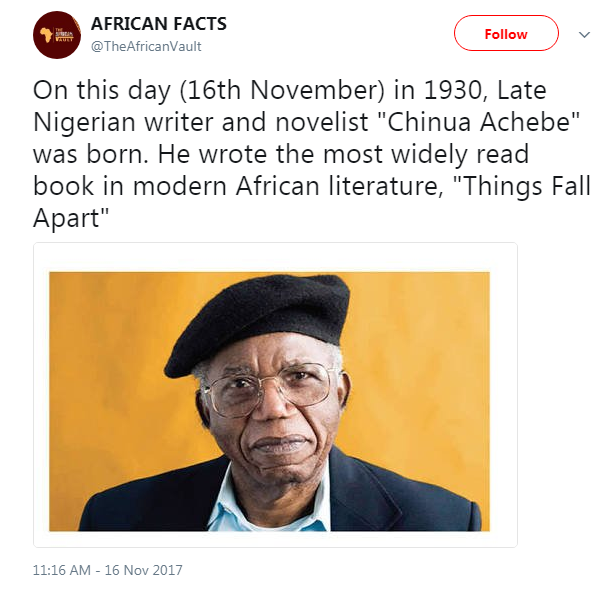 If Chinua Achebe, born Albert Chinụalụmọgụ Achebe, was still alive today, he would have been 87 years old, and one of his best works, Things Fall Apart would have been a Grand Father at 60years after first published, actually Things Fall Apart is more than a Grand Father in African Literature, it is like the Oracle of African Literature. To honour all that rare feat, Google honoured him with a Doodle, underscoring his status as a towering figure of 20th-century literature. Achebe was born Albert Chinualumogu Achebe in the Town of Ogidi, Anambra State on 16 November 1930. Raised by his parents in the same town same town as he was born, Achebe excelled at school and won a scholarship to study medicine, but changed his studies to English literature at University College (now the University of Ibadan). He became fascinated with world religions and traditional African cultures and began writing stories as a university student. After graduation, he worked for the Nigerian Broadcasting Service (NBS) and soon moved to the metropolis of Lagos where he started he writing career fulltime. Chinua Achebe is a writer many consider to be the father of modern African literature. 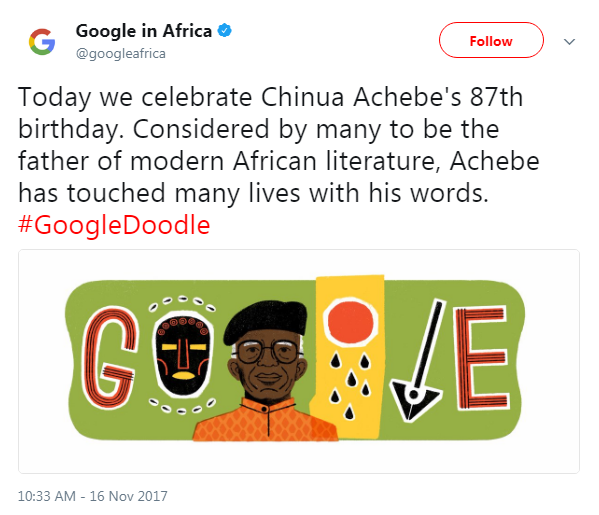 Writing amid a post-colonial movement that saw African nations cast off decades of foreign rule and seek political sovereignty, Mr Achebe lent a voice to a generation of Africans who refused to be defined solely through the lenses of European thought, and as Chimamanda Adichie recently summed it in a Ted Talk – The Danger of A Single Story. Part of that work involved telling distinctly African stories from the perspective of African characters, helping to forge a literature that — like newly created countries — was independent of Europe. 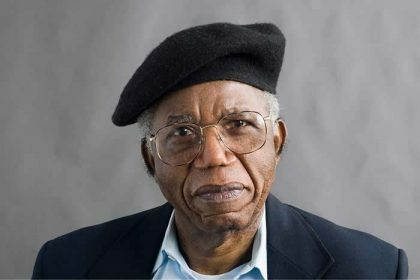 Achebe died in March of 2013 in the United States at the age of 82, having collected accolades that included the Man Booker International Prize. In contrast to European works that allowed Africans only minor or one-dimensional roles, Mr Achebe wrote novels that showed Nigerians as complex characters endowed with agency, Columnist, Jeremy B White. Achebe’s journey to literary greatness started with Things Fall Apart, his first book. Released nearly 60 years ago in 1958, it’s regarded as one of the most widely read books in Africa. It’s since been translated into fifty languages and has sold over ten million copies. His best-known work, “Things Fall Apart,” remains a staple of school curricula. It tells the story of Okonkwo, the proud leader of his village. It depicts the complex customs of the Igbo people, one of the multiple ethnic groups in Nigeria with a distinct culture and language. The book portrays how Okonkwo’s world is upended by the appearance of Christian missionaries, and its closing paragraph — written from the perspective of a recently arrived colonial leader — functions as a haunting allusion to how European observers reduce and dismiss complex African cultures. In 1987 Achebe released his fifth novel and also his last, “Anthills of the Savannah”, signalling a shift in perspectives towards the politics in Nigeria at the time. He is considered by many to be one of the greatest sons of the land.